The best Mexican tourist-fleecing operation is not the timeshare industry, it’s not the machine-carved wooden dolphins sold by beach vendors (“my family make them here!”), it’s small-scale tequila distilleries. And I say that with high praise. 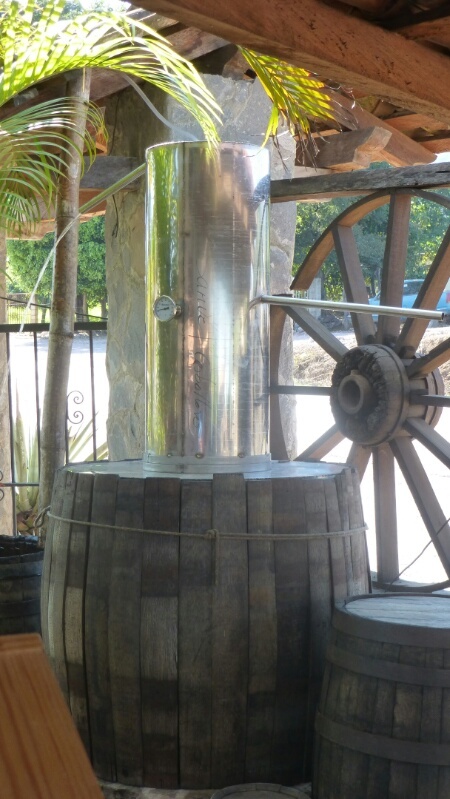 Hacienda Don Lalin distills tequila high in the Sierra Madre mountains, a two-hour bouncy tour-bus ride from Puerto Vallarta. The distillery is about the size of an American suburban patio. The tequila is ambrosial. What I got was our host (and distiller) Lalo, bless his humble Mexican heart, his small patio, and a couple dozen bottles of tequila, ready for our purchase at twenty-five dollars each. I suppose the word “fleecing” has unintended connotations. Lalo didn’t steal our money. He wasn’t running a scam. He makes great tequila and sells it directly to gringos, via a sweetheart deal he has made with the tour-bus company. Thirty thirsty gringos step off the tour bus after two dusty hours on mountain roads. Lalo pours ample tequila tastes for everyone, tells charming tequila stories, pours more tastes, tells more stories, pours even more tastes, then steps behind the sales counter and brings out the cash box. He has a captive audience. He alone is the manufacturer, the distributor and the retailer. The entire process, from blue agave piña to $25 in Lalo’s pocket, is done right there in his patio. 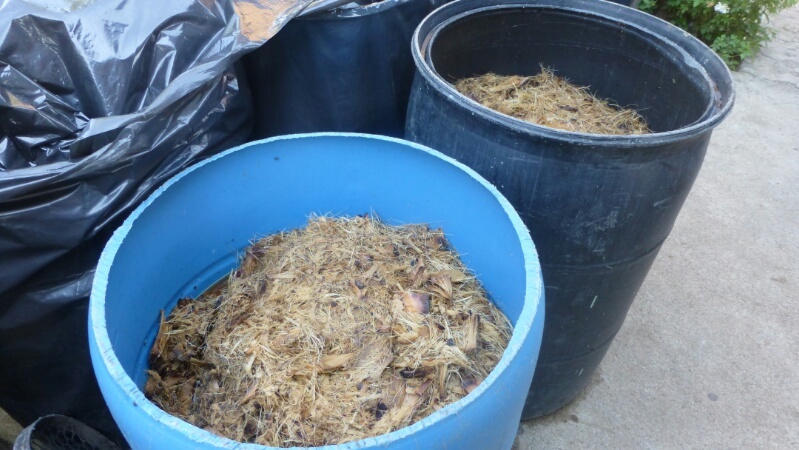 He then shreds the piñas and dumps the pulp into 55-gallon drums, where the soggy mess ferments. What comes out of the drums is the wort, just like beer, and like beer, it’s about five percent alcohol. 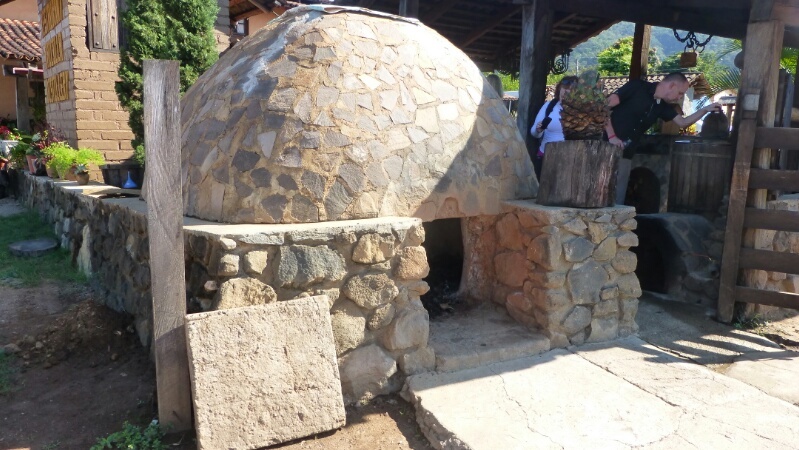 Lalo builds another wood fire — in a rickety still this time — heats the wort, and condenses the evaporated alcohol. I watched this part of the process and what emerged was what Lalo called “white lightning,” and white lightning it was, measuring about 180 proof, or 90% alcohol. This is the stuff that boils off just after the distillation process begins. It could be lethal. It does not become tequila. 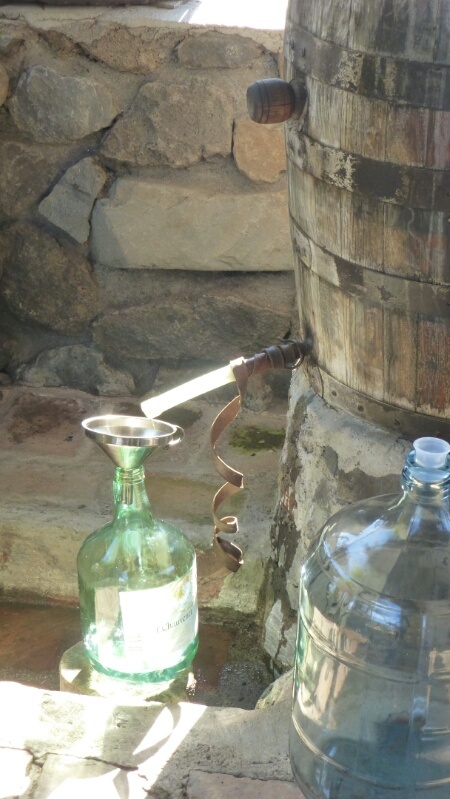 The liquid that boils off during the next couple of hours measures about 20% alcohol. There’s no doubt it’s tequila, but it’s far too sweet and there are few alcoholic complexities. So Lalo distills it again, in a fancy stainless-steel apparatus, making more white lightning and, eventually, white (or “silver”) tequila measuring about 40% alcohol. 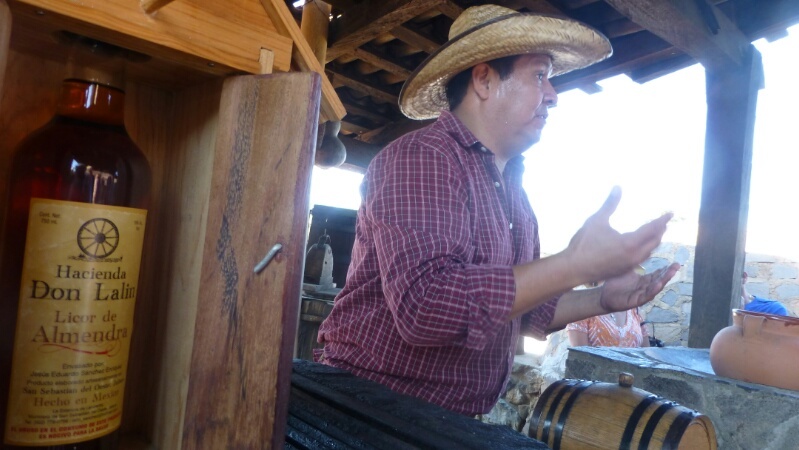 Lalo pours the silver tequila into oak barrels and lets it rest for a couple of months (tequila “reposado” — rested tequila), pours it into bottles (again, right there in his patio), glues on his label, and waits for the next bus. Louise and I bought three bottles, including infusions of almond (“great over ice cream”) and mandarin oranges. 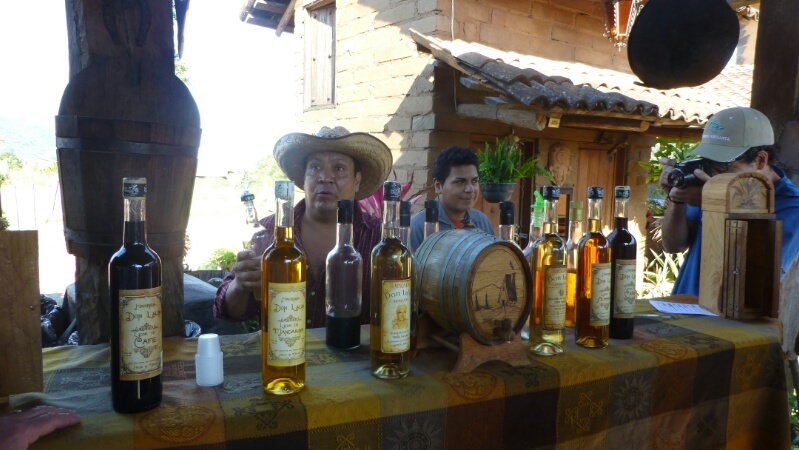 We will drink them with fond memories of Hacienda Don Lalin and Lalo’s patio-sized distillery high in the Sierra Madres. We were fleeced and we happily gave up our wool. I doubt that I will ever again slug a shot of tequila, but this story enticed me to try. But only at Don Lalo’s patio distillery. Otherwise, no gracias. Gracias for your comments, gentlemen. You’re welcome to come down for a slug any time. Sounds like a fun stop! Do you know if you must visit with a tour group or can individuals stop in? Thanks, Tom. We will be visiting the area as a day trip from PV and we do like to stumble across places like this! We’ll just have to keep an eye out. We were there in December 2016. We were tourists with Vallarta Adventures. I doubt you would ever find your way up there by yourself without knowing where you were going. It is somewhere between PV and San Sebastian, much closer to San Sebastian. Great tequila. I especially enjoy the reposado. Agreed, Lani. But I still may visit one of the big ones someday. 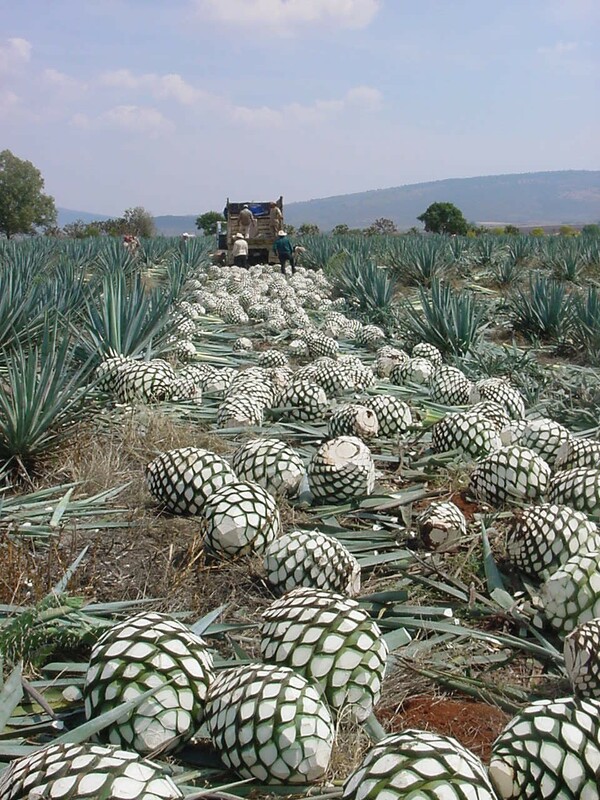 This is a really exotic place and the tequila must be all the more delicious that it is made authentically . I can’t wait to take the tour. 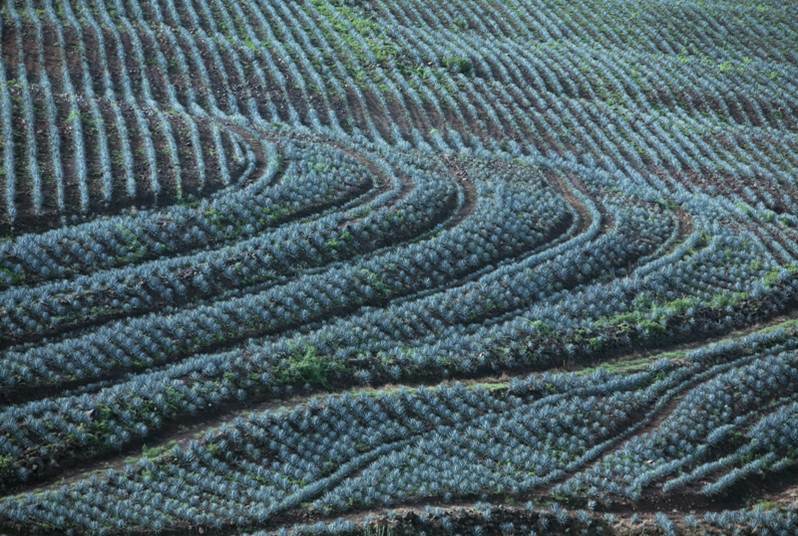 Mapi, the state of Jalisco “owns” the word tequila. Tequila can’t be made — legally — anywhere else, so I suppose it’s all authentic in a way, but it seems all the more so when it comes from Lalo’s little distillery. I do love an entrepreneur, Terri, and Lalo certainly qualifies. I especially admire his sweetheart deal with Vallarta Adventures, the tour company. It’s hard to resist a free shot of tequila after two bouncy hours on that bus! Is this mexican moonshine? I know the recipe is very different, but I suspect the tax evasion is very similar. Gerard, you provoke images of ’54 Mercs running triple Webers atop Edelbrock manifolds, dashing down dusty roads high in the Sierra Madre, their trunks full of white lightning, Mexican revenuers in pursuit, guns blazing out rolled-down windows. Cue Robert Mitchum! We stopped there as well on 01-24-14- I thought it was a very cool process. we make our own wine so I could relate to the smallness of the operation. Of course we bought so and enjoy it very much. John, we still have one bottle remaining. It’s no longer full, we’re trying to make it last. Sipping is sublime. A friend of mine brought a bottle back to Canada and treated us to a glass last summer (2013) on a visit, and it was mas fino! He had bought it on a cruise ship in Mexico. I’m looking online to find a way to order but I see this isn’t Cuervo Corporation! Good one on Don Lalo, I will just have to get on the bus out of Puerto Vallarta someday for this refined addition to my tequila bar. It has been well over a year since I last sipped Lalo’s tequila and I miss it. Tequila sipping on Oregon just ain’t the same as it is on Jalisco! It was well worth the trip. A lovely gentleman and fantastic tequila. Highly recommend you visit. Did anyone get the chicken recipe for the mandarin orange liquor. Enjoyed the whole trip with Vallarta adventures. We visited and enjoyed ever second. He never pressured anyone to buy and he wasn’t tight with the samples. Was not fleeced at all. Just wish we had bought more than one bottle of each. This stuff is a prize with all our guests. Might have to go back on holiday just to go visit ago and restock supplies. We are sitting in our backyard sipping Don Lalo’s almond tequila. We went in August. We googled and read your charming & accurate description. I agree, our regret is not buying more. Thanks for the reminder! Our stay at Mexico is a fond memory.